Ruspetro’s field of 1,205km2 is in the west Siberian basin on an oil bearing structure known as the Krasnoleninsky Arch. This is situated in the Khanty-Mansi Autonomous Okrug, also known as Yugra, in west Siberian Russia. The capital of the region is Khanty-Mansiysk which is about 160km from the field. Hover over the field area in the map for a more detailed view. 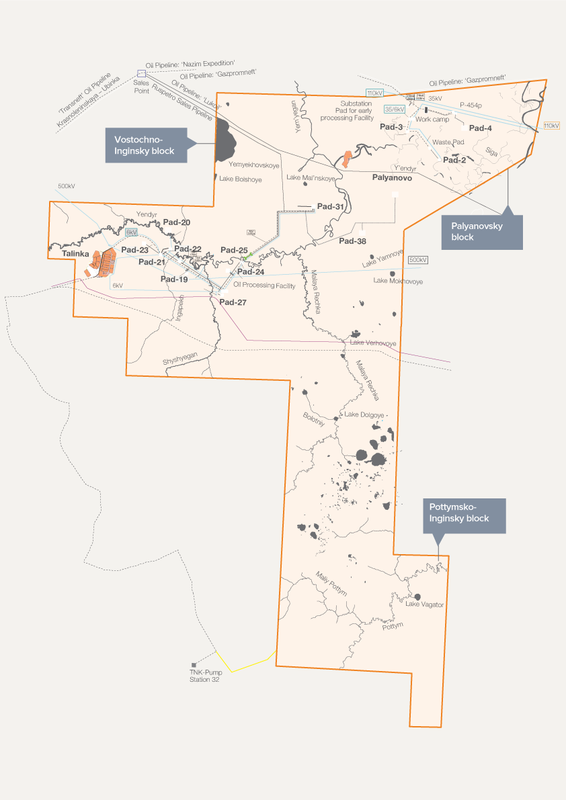 The field is bordered to the east by Rosneft’s West Kammenoe licence development, to the west by Rosneft’s Talinskoe field and the north by Rosneft’s Em-Yegovskoe field and Gazpromneft’s Polyanovskoe field. Surgutneftegaz, Lukoil and Gazpromneft all have significant oil and gas operations in the region. The Khanty-Mansisysk to Nyagan federal highway crosses the field and it is only a short drive from the highway to the town of Tallinsky where our field office is situated. From Tallinsky the field can be accessed on Ruspetro’s in-field roads. The field is situated near the river Ob affording barge transportation towards the Arctic Ocean into which the Ob flows. The federal railway network can be accessed to the north of the field. Ruspetro has its own custody transfer station on the Transneft pipeline 27km to the north of our central processing facility. Our crude is transported to this metering point via our own pipeline. The main productive reservoir types within the licence blocks are the limestone-dolomite streaks in the Abalak formation (Upper Jurassic) and the sandstones and siltstones found in the Tyumen formation (Lower and Middle Jurassic). For their intrinsic characteristics and subsequent impact on development, these reservoirs have been divided into 4 zones, namely UK1, UK2-8, UK9 and UK10-11. 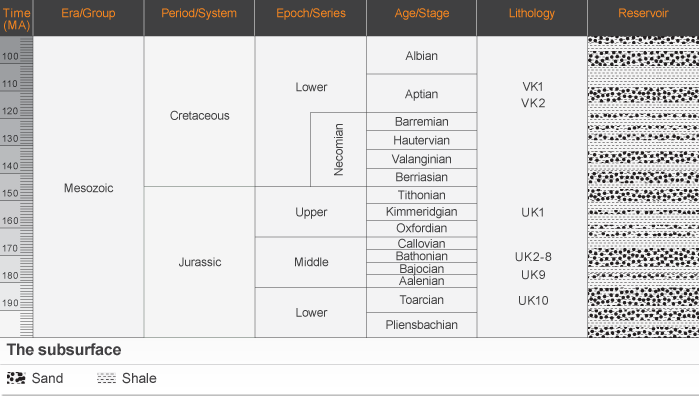 The UK1 zone refers to the Abalak formation, the UK2 to UK9 zones refer to the Tyumen formation and finally the UK10-11 zones correspond to deeper stratigraphic levels of the Sherkalinsk formation.